South Shore beach has been awarded the blue flag award for 2018. Pictured are Beach Patrol manager Rick Williams, Emma Whitlock from Fylde LoveMyBeach, Beach Patrol officer Sam Taylor and street cleanising operations manager Gavin Macpherson. Five years ago Blackpool faced the grim prospect of having to put signs up advising people not to swim in the sea. The quality of the bathing water was a major concern, especially as new European standards of cleanliness were coming into force. Banning people from taking a dip would have been a major blow to the resort. But today the town is celebrating retaining its Blue Flag for Blackpool South beach, while Blackpool Central, Blackpool North and Bispham have all received Seaside Awards from Keep Britain Tidy. These quality marks give visitors and residents the confidence to know the sands are clean, safe and well managed. 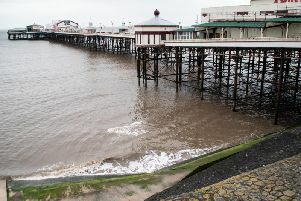 The Blue Flag is an international symbol and puts Blackpool on a par with the best stretches of coast around the world. And it’s not only Blackpool which is celebrating - bathing water across the Fylde coast has improved. Ferry Beach and Marine Beach in Fleetwood, and Rossall Beach and Jubilee Beach in Cleveleys, all overseen by Wyre Council, have all also been awarded Seaside Awards for another year. The main amenity beach in St Annes, owned by Fylde Council, also has a Seaside Award. Coun Roger Berry, with responsibility for the beaches in Wyre, said: “I’m absolutely delighted with this year’s awards that recognise how well-managed and maintained Wyre’s beaches are. Councils and other agencies including United Utilities have worked together to improve the quality of bathing water. Measures have ranged from from building new flood defences and sustainable drainage to reducing pollution from sewage systems, agricultural land and surface water outfalls. But there is still plenty to be done. Beach cleans take part one Saturday every month, organised by the LOVEmyBEach campaign. A recent clean up by volunteers on St Annes beach and sand dune area saw them pick up 61 bags of dog poo plus dozens of piles of un-bagged waste. Coun Cheryl Little, chairman of tourism for Fylde Council, said: “The Seaside Award is good news for tourism and it’s a credit to our staff who clean the beach every day, and to the volunteers who carry out weekly clean-ups. “It’s important people can see what can be achieved. Coun Little added St Annes North beach, just south of Starr Gate, was not included in the awards because it does not have a dog ban like other beaches. Coun Gillian Campbell, deputy leader of Blackpool Council, said she hoped Blackpool would continue to maintain its Blue Flag. She said: “I am so proud Blackpool South has achieved a Blue Flag for the third year running.